Ivy lake Estates is a 551 single family home community in Odessa, FL. The beauty and serenity of the gated, planned neighborhood will astound you. A perfect place for families of any age, Ivy Lake Estates boasts three areas: Water’s Edge Village, Eagle’s Nest Village, and Palisades Village. The Water’s Edge Village surrounds a large, 90 acre internal lake. This beautiful waterfront land as well as several conservation lots make up this portion of the development. The Eagle’s Nest Village surrounds a separate, 45 acre lake, and is made up of both conservation lots and regular residential plots of land. The Palisades Village incorporates culde-sacs, rounding out the private and close-knit feel of the Ivy Lake Estates. Ivy Lake Estates is known for its large houses. Many of the properties will have ample common areas, up to six bedrooms, and three bathrooms. Plantation-style porches and scenic views mean a tranquil community and pace of life. Manicured lawns and three car garages are the norm. A truly Floridian community, the homes of Ivy Lake Estates afford modern amenities and conveniences in a gorgeous, natural setting. Perfectly suited for families, there are private, parochial, and public schools in the area. Odessa Elementary School, Charles Rushe Middle School, and Sunlake High School are the public schools that serve the area that Ivy Lake Estates occupies. Entertainment options, popular restaurants, supermarket, and other stores are nearby. Beautiful weather and ease of access make life simple and convenient for residents of the Ivy Lake Estates development. Conceived of by three builders, homes here feel custom, safe, and aesthetically pleasing. Low HOA fees and no CDD fees are just a part of the overall package. There are no better Odessa, FL homes for sale. 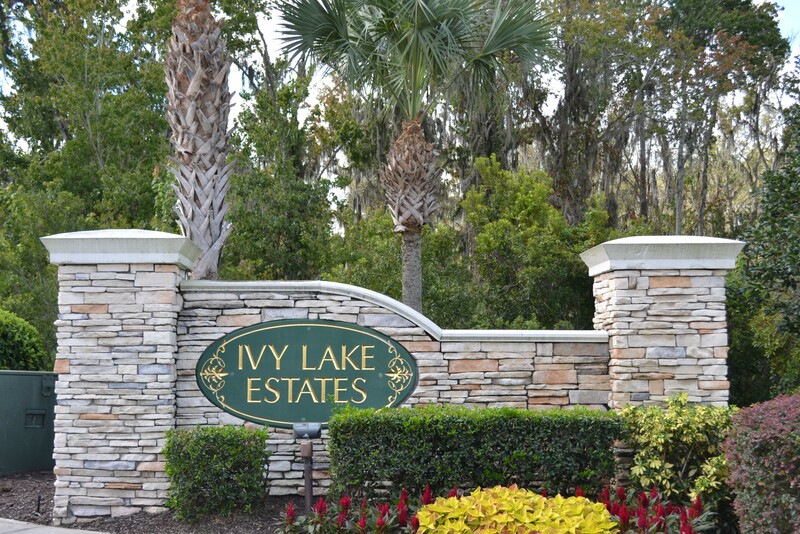 Not far off the beaten path, the Ivy Lake Estates are located in Odessa, FL in Pasco County. Relatively low property taxes and its “close to everything” convenience make this an attractive place to buy a home. At SR 64, the development is adjacent to Suncoast Parkway. Ivy Lake Estates is part of the Suncoast Crossings development, just passed the Hillsborough County line. Ivy Lake Estates homes have an affordable average sale price of $358,000, making just $125 the median price per square foot. 800 people live in the development, and the average age of resident is 46 years. Your family will fit right in with the lovely people that live in the community. Ready to tour a property? We are excited to show you homes for sale in Ivy Lake Estates, and the community itself. We love helping people find their dream home, and there are many wonderful Odessa, FL homes for sale. Call an agent today at (727) 364-4045! DO NOT MISS THIS! Located in the gated community of Ivy Lake Estates! Beautiful 5BR/3Ba, 3 car garage Pool home with upstairs bonus room and separate office. Set upon a premium wooded corner conservation site. This executive home is move in ready and features a 3 way split floor plan. A BONUS room at the top of the stairs offers great additional space for you and your family. Upon entry you have a front office and formal dining room with trey ceilings. Spacious open floor plan featuring high ceilings and 2 sets of double sliders. Gourmet kitchen features wood cabinets, large center island and granite countertops. Stainless steel appliances with gas stove. Built in wine rack and walk in pantry. Breakfast bar opens into large family room and breakfast nook. Indoor laundry room. 3 way split plan features oversized master bedroom overlooking pool. Second bath sits between 2 bedrooms and third bath serves as a jack and jill bath between 2 bedrooms and serves as a pool bath as well. Relax or entertain in your outdoor oasis, with extended lanai overlooking the tranquil conservation. Located in the sought after GATED community of Ivy Lake Estates, amenities include park, playground, low HOA dues, close to shopping and major highways. Easy access to Tampa International Airport, malls, hospitals and everything the suncoast has to offer. Welcome to your new home! Beautifully updated home in the highly sought after gated community of Ivy Lake Estates. This home features 5 bedrooms and Den/ Office. Elegant style with large, open floor plan, with exquisite new marble flooring throughout the home. Foyer opens to living room and dining room, den/office, guest bedroom and full bath. Kitchen features new granite counters, solid wood cabinetry, stainless steel appliances, large granite island, double closet pantry, dinette space that leads out to a side lanai where breakfast can be enjoyed outside. High ceilings throughout home and open family room, sliders opening to your own oasis in your backyard. Elevated ceilings, crown molding, and large walk-in closets with marble floors is luxury at it's finest. Fresh paint throughout home. Spacious first floor master suite includes double sinks with vanity, linen closet and large walk in closet. Upstairs you'll find a over sized bonus/media room for entertaining as well as a bonus bedroom. Weather is perfect to take some time to relax and enjoy this serene salt-water pool. Upgrades: new marble, new granite, and 2 year old pool. Gated community with virtual guard. Community has two parks, soccer field, basketball, and sand volleyball court. One playground is shaded & covered pavilion. Great location w/ easy commute to airport(approx. 20 min),downtown, shopping, restaurants and more! Low HOA and No CDD's. Perfect home for large families or multi-generation families. Bexley, Rushe Middle, and Sunlake High. MOVE IN READY .BRING ALL OFFERS.Backing up to 5 acres of conservation,extra large 50 Gallon water Heater,screened-In Patio 387 sq ft,tiled. Fireplace,Gas .Built In compartments plantation shutters ,wood floors Glass kitchen Island,Breakfast Bar,Exhausted Fan for stove,vented to outside,cabinets in Garage,Recessed lighting throughout the house,rounded corners on walls ceilings are 28 ft,Double Patterned tile designs, French Doors ,A/C unit (2016),Roof (2003) 30 yr warranty. countertop,sink in laundry room. Beautiful two story contemporary home located in the gated community of Ivy Lake Estates on a cul-de-sac street. Premium homesite backs to Lake Nikki. Spectacular water views from the 35' lanai and 35' balcony. 5 bedroom - 3 bath - 3 car garage. From the grand foyer you will notice the beauty, design, and attractive architectural features, a theme that is carried throughout the home & manicured grounds. Magnificent ~22' x 17' family room with 8' glass doors overlooking Lake Nikki plus volume ceiling with recessed lights, ceiling speakers, & lighted ceiling fan. Double columned knee wall introduces the culinary center with scenic lake views. The formal dining room adjoins the gourmet kitchen that features 42 maple cabinets, lg center island, desk, and spacious cafe for informal dining. ~17' x 13' living room provides another grand entertainment space. Privacy hall to lg laundry rm, full 2nd bath, and 5th bedroom. The first floor bedroom next to a full bath is perfect for guests. Elegant staircase w/banister railing and landing to 2nd floor. Huge 22' owner's retreat w/vaulted ceiling and french doors to the balcony. The 22' private bath includes separate vanities, soaker tub, walk-in shower, private water closet, and two XL walk-in closets. Very nice 2nd/3rd/4th bedrooms adjacent to the full 3rd bath. The shimmering waters of Lake Nikki that lap at the shore provide the perfect setting for the white picket fence, lush grounds, expansive lanai and expansive balcony. 3 car garage and large driveway.